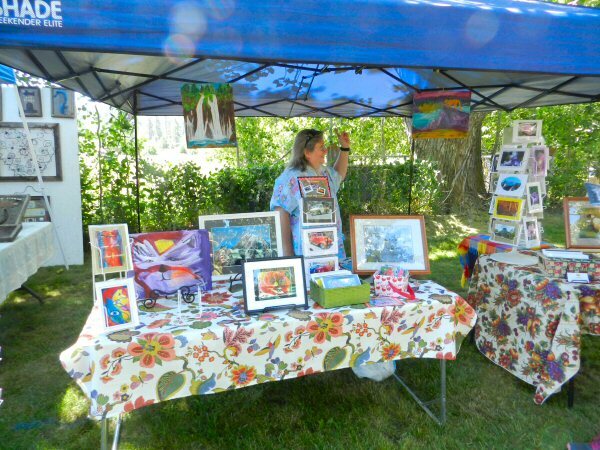 On Monday August 25, my wife Linda and I needed to go to the Inter-Mountain Fairgrounds in McArthur to submit our photography, poetry, and art exhibits for the upcoming fair. My daughter HanaLyn and her friend Jamie Barrows are visiting from Maryland, so they came along to see some of the beautiful Pit River Country. After taking care of the business with the helpful Inter-Mountain fair staff, we stopped at the Frosty in Fall River to pick up some sandwiches and drinks. We then headed to Hat Creek Park on Hwy 299 for a picnic on our way home. 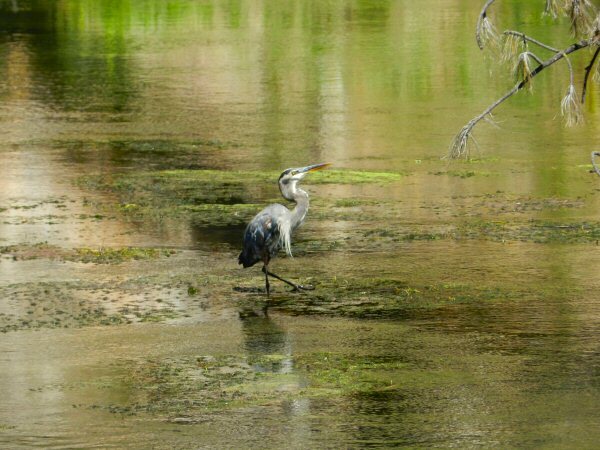 As we were walking to the picnic table, I spied a heron standing in the middle of the creek. HanaLyn headed down to the bank. Linda hastily pulled out her camera. I raced back to my car to get mine, hoping that the heron wouldn’t fly away before I could get a picture. The heron wasn’t even phased by us. He simply dipped his beak into the water and came up with a frog. He got a good grip and then down the gullet it went. Then he strutted a bit in satisfaction. 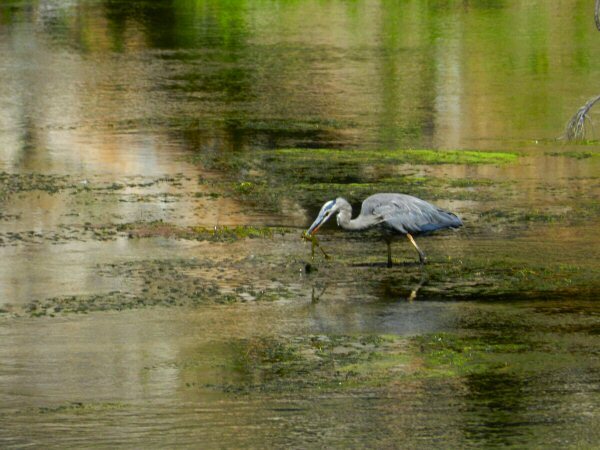 After watching Mr. Heron enjoy his lunch, we decided to sit down and enjoy ours. However, before we could even open the bag, we were swarmed by yellow jackets. Jamie is allergic to bee stings, so we hastily retreated back to the car and headed over to Baum Lake and the Crystal Lake hatchery to enjoy our lunch at the picnic table there. We met a friendly couple from Redding at the picnic table. They were enjoying a cool ride on their motorcycle through the beautiful country making a loop up 299 through Burney, heading down Baum Lake Road to Cassel, then continuing down Hwy 89 to Lassen Park, and finally riding back down through Shingletown to Redding. After lunch, HanaLyn and Jamie had fun photographing some of the albino Eagle Lake Rainbow Trout. Each year, out of the millions of eggs hatched at Crystal Lake Hatchery a few albino mutations occur. The hatchery does their best to nurture and raise these albinos. Some of them are now also on display at the Turtle Bay Museum in Redding. Linda had some photos to give to the staff at the fish hatchery so we stopped in for a brief visit to drop them off and then crossed over to Baum Lake. 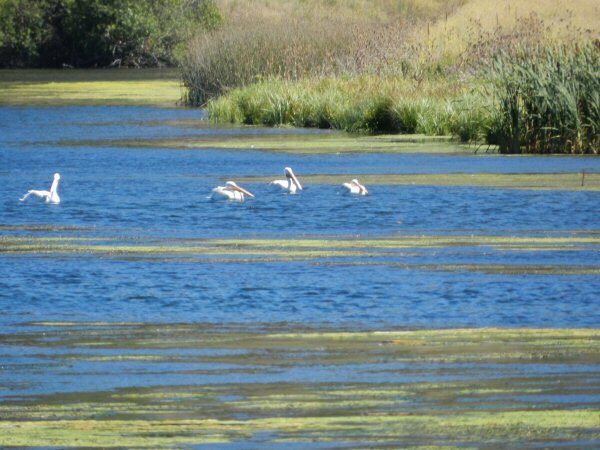 White pelicans were swimming in the lake. 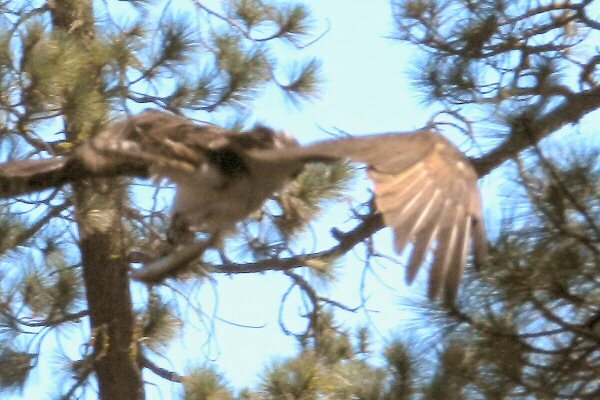 Ospreys were flying overhead. Also, a fisherman, Michael Hurdle from Richmond, Texas had just arrived. Hurdle was traveling from Sacramento to Likely, California, a town of 99 people south of Alturas to visit his sister. He saw a sign for a fishing lake on the highway so he detoured to enjoy a brief respite fishing. “Well, you’ve just come to one of the best fishing lakes in the country.” I said. The pelicans patiently feeding from the lake and the ospreys overhead testified to the veracity of my statement. 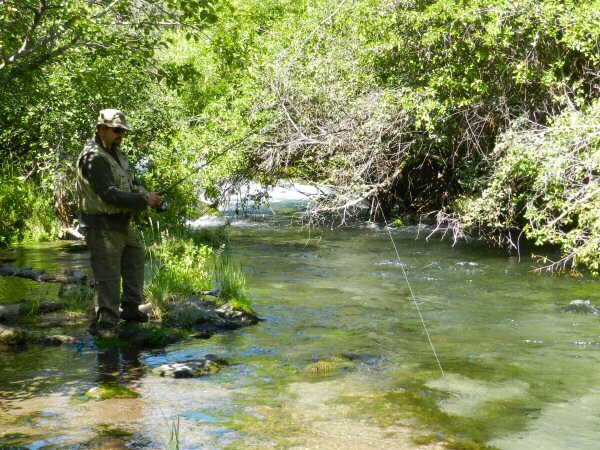 While in Sacramento, Hurdle had spent some time fishing the American River. 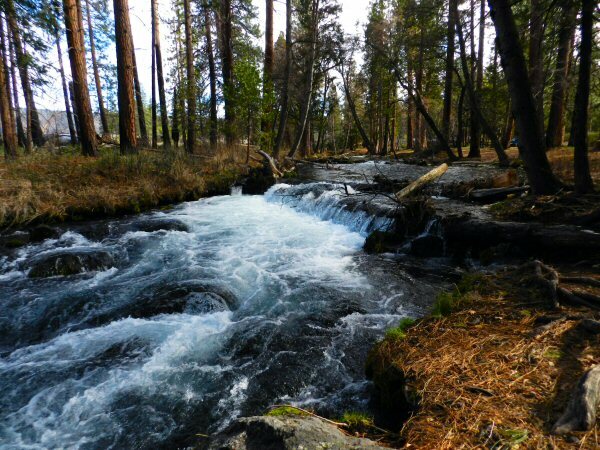 He said that the water was low and mentioned that a portion of the Merced River had been closed due to the drought. I told him that the waters here were fairly normal because Hat Creek and Fall River were fed from a giant aquifer, a honeycomb of underground lava tubes that gave rise to many springs in the area. I also told him that the hatchery across the road regularly stocked the lake, though I wasn’t sure when they had stocked it last. Hurdle did another cast with his fly rod, taking measure of the wind and current in the lake. He smiled and said he wasn’t overly concerned whether he caught a fish or not. “What better way is there to enjoy an hour break before I continue on my way?” he asked with a blissful smile. I wished him luck and went down to the boat launch area to rejoin Linda and our guests. I heard a truck pull up and looked to see Kristen Idema, a friend of Linda and mine from Redding. We hadn’t seen her for several months and hooped with joy at our surprise meeting. After hugs, I introduced her to my daughter and Jamie and she introduce us to her friend from Michigan, Deborah, that she had known since she was in the fourth grade. 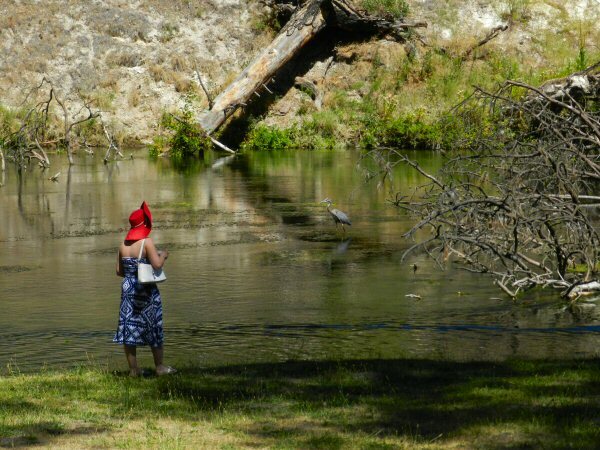 Deborah and her husband had come for a week of camping at one of the campgrounds on Hat Creek. Kristen had driven up from Redding to spend the day with them. They had just visited Burney Falls. 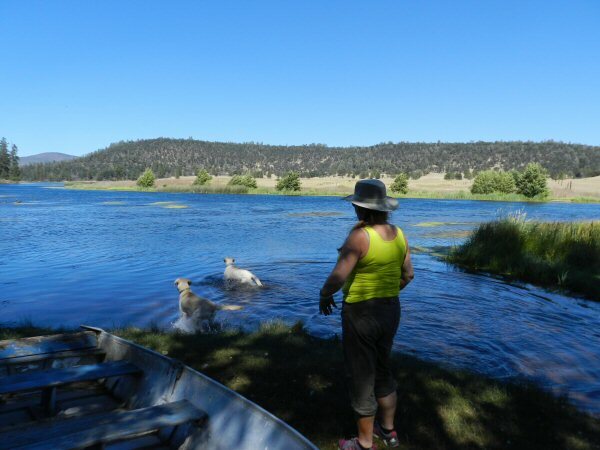 Deborah let her two beautiful labs out of the truck to enjoy a swim, while Kristen and I caught up on the past few months. This year The Crystal Lake Fish Hatchery will stock 1.8 million trout. 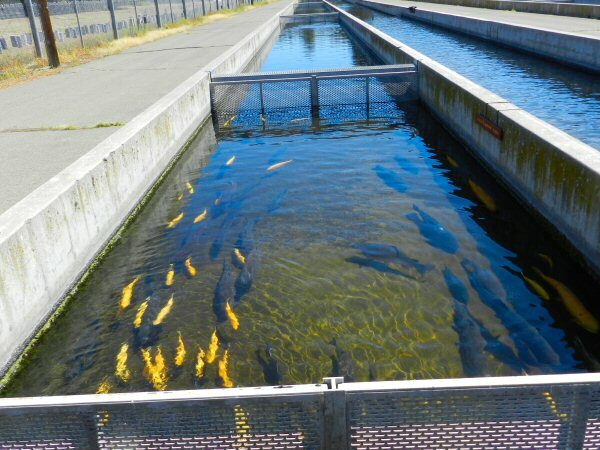 In addition to the 16 counties in California which they normally supply, they are also supplying fish to the Darrah Springs Trout Hatchery east of Redding and the Mount Shasta Fish Hatchery, both of which were quarantined in June because of infection by whirling disease. 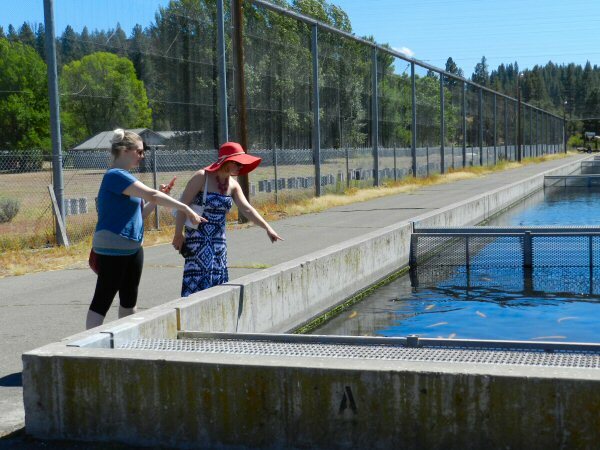 On Thursday August 13, my wife Linda and I visited the Crystal Lake Hatchery. I had an appointment for an interview with Shane Overton, the manager. As well as learning about the general functions and processes of the hatchery, I also wanted to get information on planting this year, the effects of the drought, and impact of the whirling disease. Shane Overton, his assistant manager, Francisco Cabral, and their staff were all very friendly and helpful. 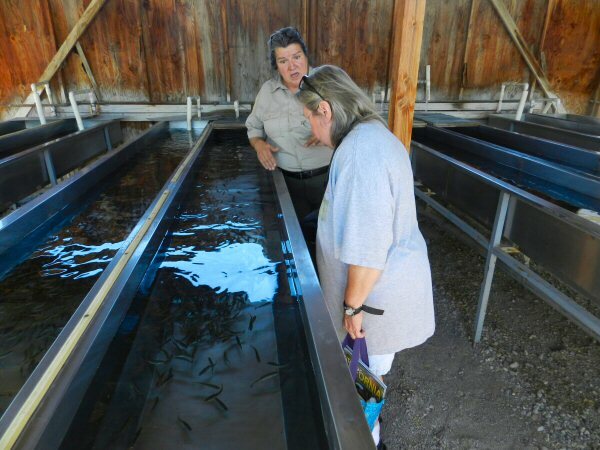 As we entered the grounds we met Mary Elizondo who oversees the hatching and early development of the trout. 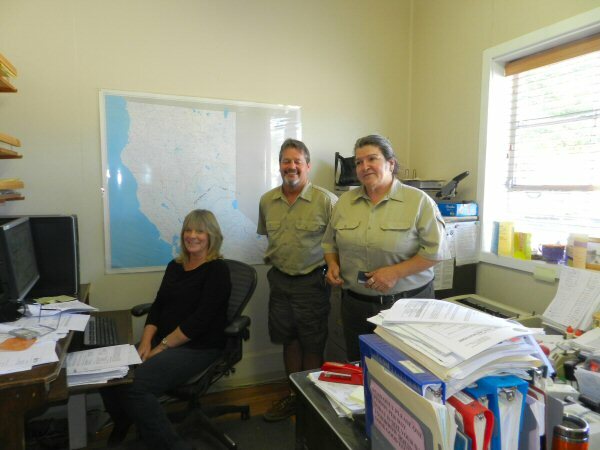 She directed us to the office where we were greeted by Overton and his secretary, Debby. 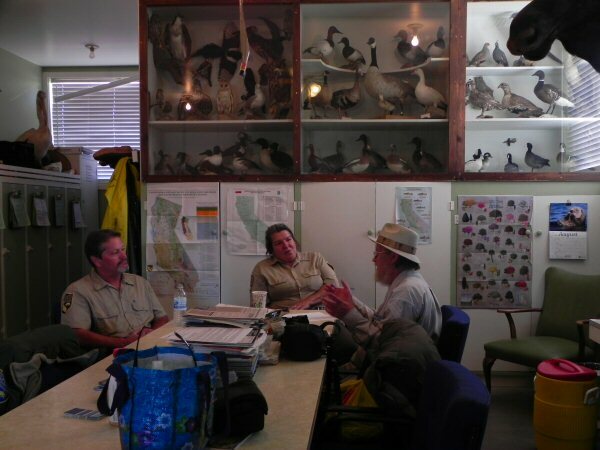 Overton ushered us into the meeting room, where we had an hour long discussion on this year’s operation of the hatchery. 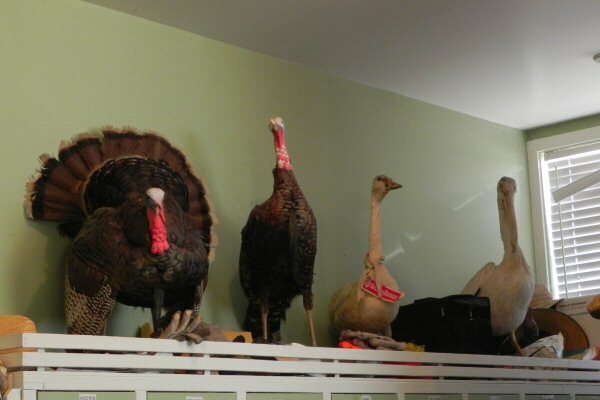 The walls of the meeting room are lined with a remarkable display of wildlife taxidermy including a moose head, a wild turkey, an American Pelican, a buck, and a wide assortment of local birds. The drought has had some effect on planting. 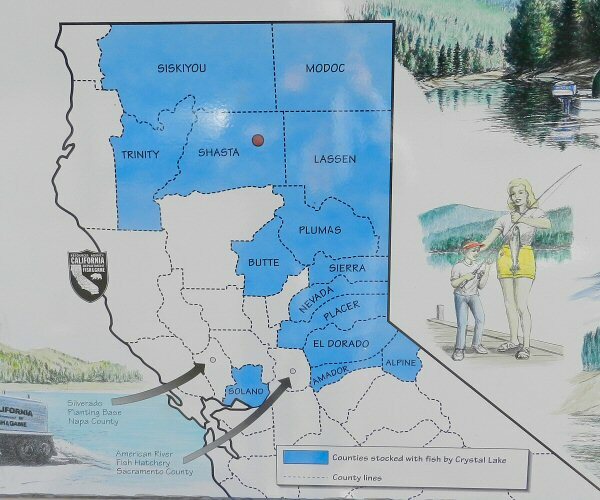 In areas such as Modoc and Lassen Counties, where streams and lakes rely on snowmelt for water, the hatchery planted the waters earlier. In April, they planted 20 percent of their stock. No fewer trout were planted this year, but because of temperature and water conditions, the earlier plants contained fish that were smaller. As the year has progressed and the fish at the hatchery have matured, the size of fish being planted has returned to normal. The waters in Eastern Shasta County have not been so affected by the drought. In Fall River Valley and Hat Creek the waters are fed by springs coming from underground lava tubes in addition to snowmelt, so even in drought the water levels have remained relatively consistent. Concerning the whirling disease, there has been no trace of the disease in the Crystal Lake Hatchery or the waters planted by them. 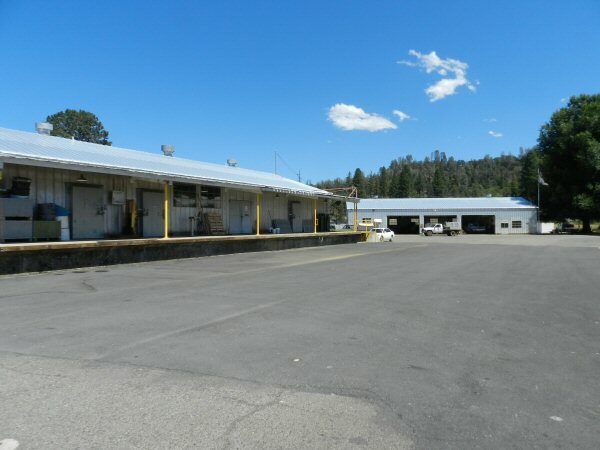 Trucks from the Darrah Springs and Mount Shasta hatcheries regularly come to be loaded with fish. Before they enter the hatchery they are decontaminated to ensure that there are no bacteria. 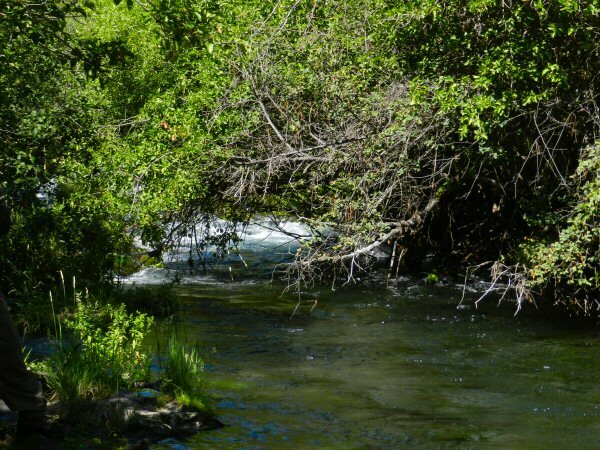 Darrah Springs and Mount Shasta hatcheries are both still under quarantine. Overton said that the cause of the infection was not yet certain but it is suspected that an otter infected with spores got into a stream which supplied water. 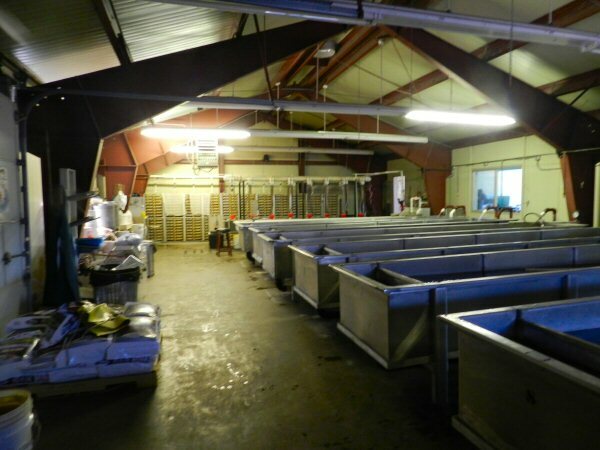 The hatcheries are still being decontaminated and it is hoped that they will reopen sometime next year. The entire interview was very pleasant. Overton has worked at the plant for 20 years. His father also worked for Fish and Game. When he was a boy he would often go out with his father to plant fish. He and Elizondo are knowledgeable about hatchery operations not only at Crystal Lake but throughout the state. Toward the end of our conversation, we were joined by assistant manager Cabral who also added his insight. Everybody obviously enjoyed and took pride in their work. Overton said that he was happy to “serve the licensed fishing public” and explained that most of the funding for the hatcheries comes from the sale of fishing licenses. 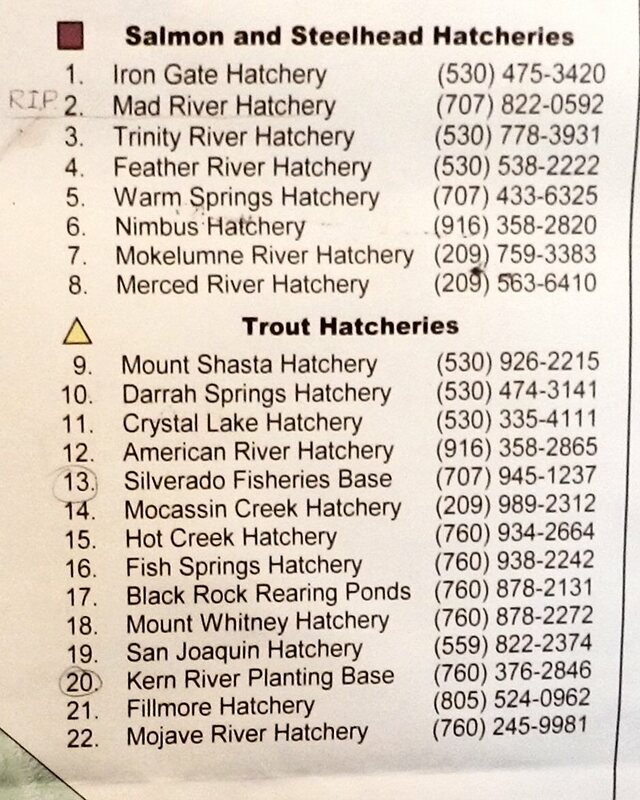 There are 22 state fish hatcheries. Eight of them are anadromous Salmon and Steelhead hatcheries and 14 of them are Trout. In addition to receipts from licenses, some hatcheries are mitigated by funding from various agencies and corporations. 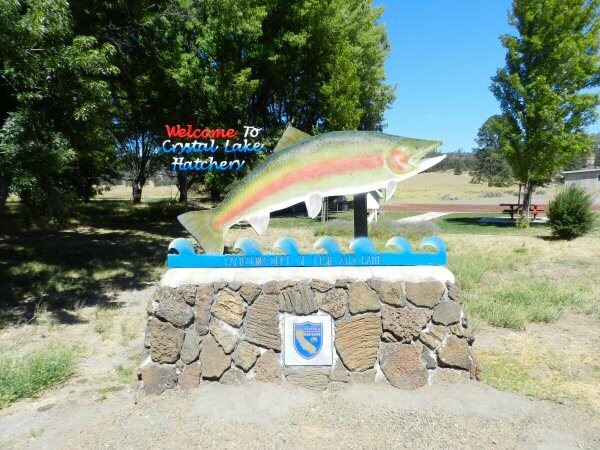 The Crystal Lake Hatchery receives some funding from PG&E to compensate for stocking certain waters where normal fish migration has been affected by PG&E development. Overton laughed and said that that story had been going around since he was a child. He and Elizondo assured me that they do not anesthetize the fish before they are transported for planting. After the interview was over, Linda and I thanked everybody for their hospitality and help and went out to take pictures of the facility. We were in for a special treat. Elizondo followed us out and asked if we would like a tour of the hatching process. Elizondo has earned the nickname “Mama.” In addition to other responsibilities, she raises millions of Eagle Lake Trout from egg to catchable fish. Beginning in 1959 from 16 fish, the Eagle Lake Trout program has become one of the hatchery’s major success stories. The program allows the restocking of Eagle Lake with this unique native species. It also enables the planting of Eagle Lake Trout in other selected waters of the Pit River basin. As with planting of other trout species, this not only provides a catch for fishermen but also helps to maintain the survival of native wild trout that would otherwise be depleted by overfishing. She took us through two buildings explaining the process. The eggs are incubated in trays until the eye develops. Then a machine separates the healthy eggs from those that did not survive. Next she transfers the eggs to a trough where they develop through the larval stage. When juvenile fish have developed, they are transferred to deep water tanks where they grow as fry and finger fish. Once they reach sufficient size they are transferred to the outdoor tanks. 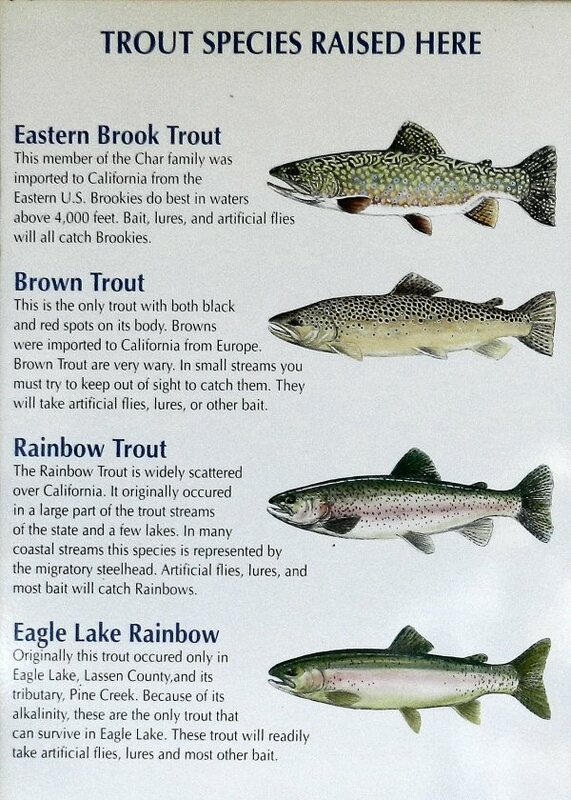 There the fish continue to mature into small catchable trout, large catchable trout and the very large trout that grow to over 14 inches in length. It takes about 18 months for a trout to develop from egg to a trout that can be planted in a stream. As mentioned before, the hatchery this year will provide 1.8 million trout to be harvested by the licensed fishing public. This week alone more that a hundred thousand pounds of fish will be planted in Lake Alomar. After our informative tour, Linda and I took a few more photos, rested a bit in the pleasant picnic area provided by the hatchery, and then headed home reflecting on how delightful it is to visit the Crystal Lake Hatchery. At 9 a.m. on Saturday July 25th, my wife Linda and I set up our vendor booth at Rim Rock Ranch for the annual Old Station Volunteer Fire Department Barbecue. 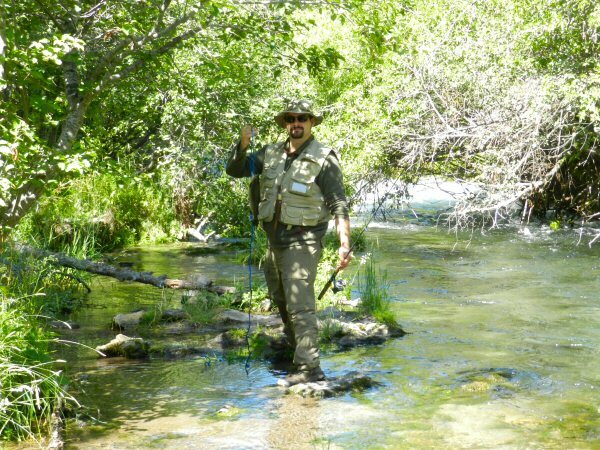 It was still early and the barbecue didn’t start until noon, so I decided to mosey around and check out the fishing on Hat Creek. Stopping in at the Rim Rock Ranch Store to buy a candy bar and get change for a twenty, I asked the clerk how the fishing was. She told me it was good. I asked if people were saying that any spots were particularly good. 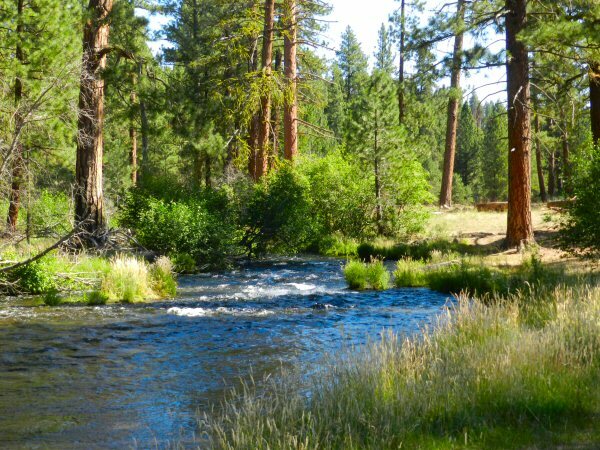 I headed up the road toward Lassen Park to explore the picnic areas and camp grounds that had access to Hat Creek. A little ways up the road I entered Old Station Picnic Area. No one was there, so I decided just to sit for awhile, reflect, and commune with the natural beauty. Shortly, I heard a flutter and saw an osprey flying down the creek. 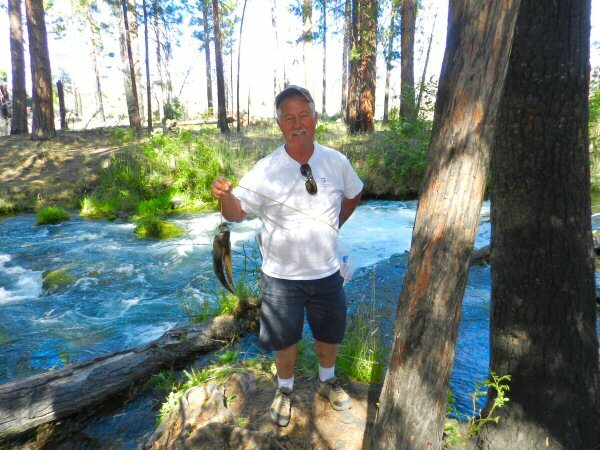 It landed a short ways downstream on the branch of a ponderosa pine. I got my camera out and approached it shooting pictures from various locations as I went. Eventually I was standing right across the creek from it with a clear view, hoping to get a good shot when it took off. Unfortunately, after about 45 minutes of waiting, I became impatient and zoomed in to get a closer shot of the head. 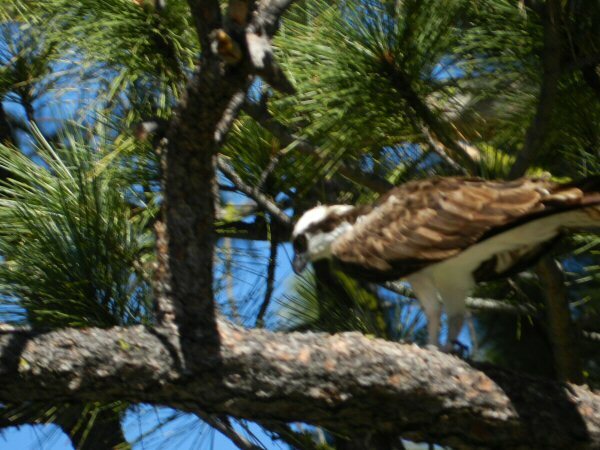 Just as I did, I saw that the osprey was preparing to launch. I fumbled with my camera as the bird rose into the air and dove straight down into the creek below. Wings flapping and talons extended he snatched a fish and flew downstream. I hastily shot a picture, but all I could get was a blurred picture of him flying off with the fish in clutch. It was an awesome sight, and I only regretted that I had not waited a minute more and gotten a clear shot of the catch. I got back in my Jeep, left the picnic area and drove a little farther down to Hat Creek Campground. After parking, I headed down a trail to the creek. Here the creek was deep and narrow with parts of the channel as deep as five feet, I thought it looked like a great place to swim. As I neared the bank, I heard a voice from behind a tree. It was a young fisherman who had caught a nice rainbow trout using salmon eggs. His name was Devin Gaumont. He lives in Campbell in Santa Clara County and had come north to share a fishing trip with his father. I introduced myself, and he cheerfully consented to let me take some picture of him fishing. Wishing Gaumont continued success, I headed back to the Rim Rock Ranch to see how Linda was doing at the barbecue. I showed my pictures of the raptor to several people. I actually had thought it was some kind of hawk. One woman told me that it was a young bald eagle. 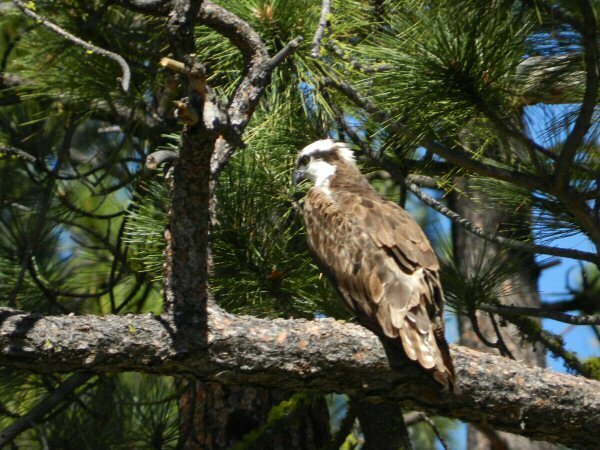 However, several agents of the US Forest Service at their booth informed me that it was an osprey because of the brown band across it’s head and the short dark beak. The eagle’s beak is longer and yellow and hawks have a brown head. That mystery solved, I enjoyed a humongous and delicious barbecued chicken lunch. Then I gave some Pacific Trail Hikers a ride to the Old Station Post Office two miles up the road. I spent some time at the booth with Linda, talking with visitors. 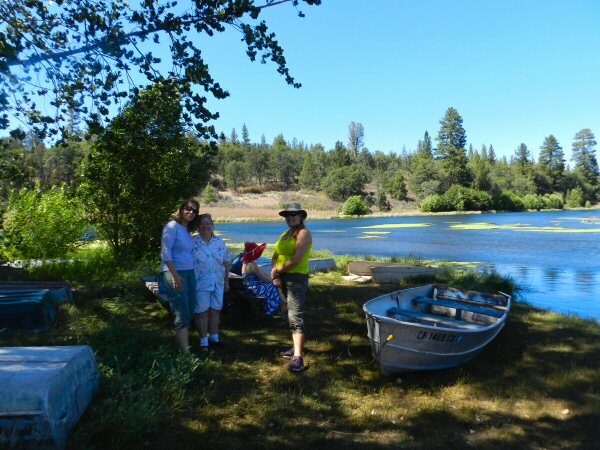 I met locals from Burney, folks from Sacramento and the Bay Area who owned vacation homes in the area, quite a few day trippers from Redding, and even some Filipino Texans and tourists from as far away as Germany. As the afternoon wore on however, I grew restless again and decided to drive down Hwy 89 to Bridge Park. Bridge Park is lovely. There’s a nice little cascade under the bridge, a little sandy spot where you can wade into the creek, and a pleasant trail that goes about a quarter mile down creek to a small falls. 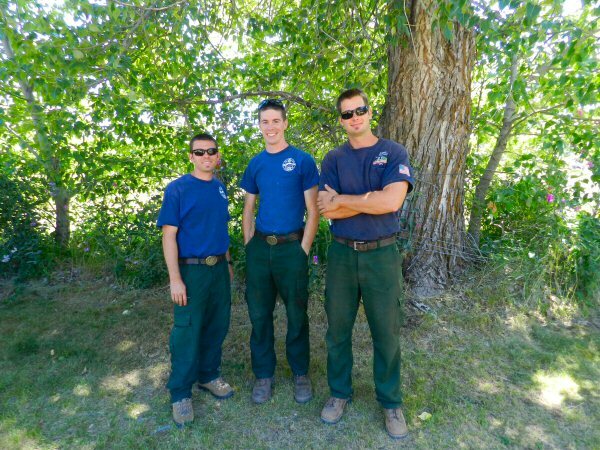 Fortunately, the park has been spared the forest fires that have ravaged Hat Creek Valley in recent years. Due to timber falls and varying temperatures, the stream and landscape are different each season of every year. The afternoon had warmed up and I was beginning to feel a bit bushed. I took off my shoes and socks and waded into the creek, getting my pant legs wet. The water was shockingly cold and my submerged feet and ankles began to sting. I walked back up the bank and sat down on one of the picnic benches. Cooling off my hot feet had refreshed my entire body. Downstream I saw a couple sitting silently by the stream in canvas chairs just looking over the water. The fortunate fisherman’s name was Harry. 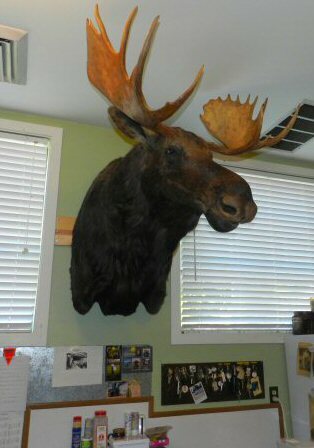 He and his wife live in Sacramento. 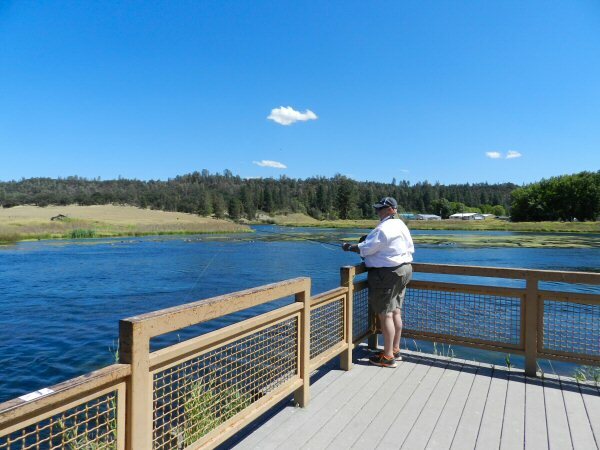 Bridge Park is one of his wife’s favorite places, and he loves to come up here and fish. On this occasion, he had caught his three rainbows using a Rooster Tail lure. I had a nice chat with Harry and his wife and headed back to Old Station. The barbecue was winding up. Linda made a few closing sales. We packed up, said our farewells to new friends, and drove back to Burney. When we got home, I immediately took off my clothes and dove in my deliciously refreshing unheated swimming pool. After cooling off, I sat down at the patio table. My little furry golden cat jumped on the chair next to me demanding to be petted.